Zuko Puppy absolutely LOVES this giant pink donut toy. There’s two squeakers and a rattling thing in it–and of course, a lovely little space to put one’s nose. This weekend, we’re hoping to bring him to the beach! Did I write this last week? (If so, we didn’t go). He really likes to dig but Shiba’s are infamous for not being too fond of water. Idk, we’ll see. This whole week has been really funky in terms of Hawaii weather–it’s beautiful morning showers until 7AM or so, then it’s scorching hot until maybe 2PM, then it’s humid as hell until 5PM, and then it pours cats and Shiba Dogs around 7. And repeat! This is nothing compared to that crazy storm in Australia–if anyone from down under is reading this, I hope you’re safe and sound! Gosh, can’t it be [Aloha] Friday already? RIFLE PAPER CO!!! MUST I SAY MORE?! I LOVE their floral designs–Birchbox offered a bunch of Rifle Paper Co. add-ons for April and let’s just say…I ordered 2 (of 3). Haha. But anyway–here’s what I got this month! I’m a little bummed (just a little) because I know the POP Beauty palette was one of the sample choice options…but not the one I picked. Oh well. Overall, I’m really pleased with my picks! Everyone is talking about Jouer at the moment–I was kind of hoping for a creme blush but I’m looking forward to trying the brand. I absolutely always love skincare so that serum/treatment thing will definitely be used soon, and shampoo/conditioner? Will come in handy. Practical practical practical. I haven’t actually received my box yet, but I’m wishing and dreaming for some Rifle Paper Co. cards that were included as a bonus item……AHH A girl can dream, right? Just a question for other Birchbox subscribers (maybe this is more of a Hawaii problem): Has it been taking FOREVER for your box to arrive? I feel like I don’t get my box until 3 or 4 weeks after I get that email that says it shipped. This is longer than usual, for me. Oh well. Looking forward to May’s selections! GOSH if there was one subscription service that I’ve never felt an ounce of regret signing up for…it’s definitely, hands down, Rachel Zoe’s. Heck, I’m already crazy excited for her Summer box and it’s not even coming for another 3 months! But before we get ahead of ourselves, let’s start with her debut box for Spring 2015. First of all, let’s start with the cuff. OMG 18k gold plated YES!!! I love this item, I’ve already worn it several times and to all sorts of events (work, a wedding, date, etc.). The only issue I can see is that it’s kind of small–I have very small wrists and this fits me like a glove. If my wrist was just maybe…half an inch wider, it wouldn’t fit very comfortably. I feel bad–it worked out for me but I can imagine that there were lots of other subscribers who would be forced to gift or trade this item because it didn’t fit. The nail polish trio is beautiful–Zoe (the white shade) was designed to coordinate perfectly with the other two colors. That ‘Box of Style’ card provided some helpful tips on how to use this product and all the others. The sunnies I wasn’t sure if I’d like or not–they fit great but they’re a bit rounder then what I would have picked for myself. However, I’ve worn them a couple times and have gotten lots of compliments! And did I mention that they fit great? I figure that’s the most important thing. Thanks, Rachel Zoe, for forcing me to try something new. I signed up for an annual subscription so this box was about $90, for me. I loved the items. I LOVED THEM. Just the value of the cuff (which fits me great, I’m sorry everyone else who it doesn’t fit D: D: D: I feel really bad) makes this a great deal but I’m just so happy with all the pieces! Can’t wait to share when we get more spoilers for Summer! 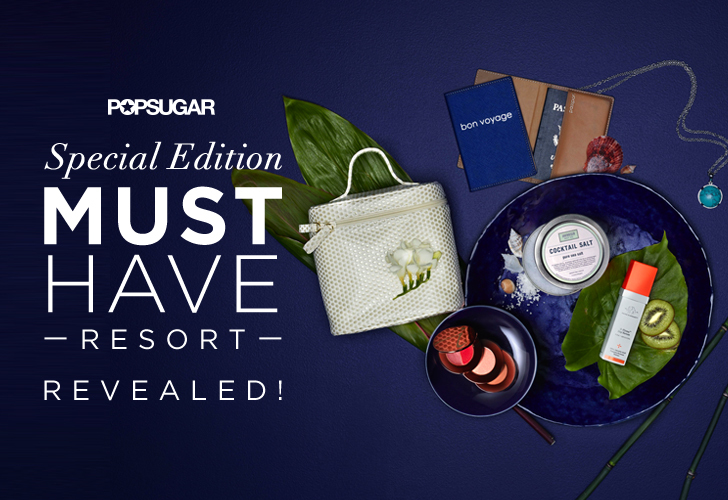 In my attempt to save money, I do not subscribe to PopSugar’s monthly MUSTHAVE box because it’s $40 a month (which is too high for a monthly subscription, for me)…but I am 100% more likely to spring for their limited edition boxes because it’s a one-time deal. Does the cost pretty much even out? Yeah, I guess so. But it’s all in the head, right? The Resort edition is one of those that I fall for but I can totally justify it in my head–it contains travel friendly items that are beachy themed–which definitely fits into my lifestyle! So I got one. Normally, I just stick my cosmetics in a makeup bag (that’s overflowing) and my skincare into a plastic ziplock (that also overflows). I wasn’t too excited about this train case, at first (who needs a $60 makeup bag?) but gosh–this item is awesome. It feels luxurious and I love that the inside is lined with plastic. It’s going to make my travel-life significantly better because…I think of it as portion control for beauty products. Whatever fits, fits, and whatever doesn’t fit, I probably don’t need. Which brings me to the serum and makeup. Serum YES thank you skincare! I’ve never tried this brand but the packaging is super cute and I love that they’re eco-conscious. I feel like a serum that brightens is especially important in summer–with all. that. sun! I won’t be bringing this with me on travel, but the makeup kit, I definitely will. This is by Jane Iredale (have never tried this brand either) and has a bronzer, a blush, and two lipglosses. All I need to bring are products for eyes and then I’m set! I normally don’t wear big statement necklaces like the Lele Sadoughi piece that came in this box, but this will be PERFECT for summer. It’ll go great with maxi dresses, denim jackets, beach coverups, swimwear, sundresses, simple V-neck shirts, I could go on and on. It’s not turquoise–but that’s fine–the stone has a nice feel to it. So what did you guys think? I saw an estimated value of about $370-$400 floating around for this box but personally, I’m gauging it on how much I’ll actually use the items…and I’d say it’s a good haul, wouldn’t you? I feel like the excitement factor isn’t as high as say, the Rachel Zoe box, but THANK YOU I will definitely use (or gift) every single one of these items. I’m pleased! Gosh, reading nutrition labels is depressing sometimes, especially when you find out that simple things (like your favorite fiber bar that you thought was healthy) have so much sugar in it. One way that I’m attempting to cut out the sweet stuff (and hopefully lose the last 5 pounds that I want to drop) is to snack smart, and to make it fun, I signed up for graze. graze is a snacking subscription–they send you a regular selection of snacks, straight to your home and workplace. They have a bunch or different kinds of subscriptions and sizes, but I signed up for the sugar count box. (They have a calorie count one, too). Also, you can choose the intervals that you receive it–this box retails for $6.99 (free shipping) and you can get it every week, every two weeks, and I choose to receive it once a month. I tried the tomato and basil pizza mix today–it was DELICIOUS. It was a great mix of savory flavors and I didn’t miss having anything sweet at all. I loved that there was a little fat in it–I think I can hold off my hunger until lunch (I start at 630 and its a long time until a noon lunch break ;_;). The second best part? 120 calories. YES. THANK YOU. I’m really interested in trying the other ones, especially the pho. It’s a paste with add ins–you just get some hot water and add it in a mug. Sweet! I absolutely love graze–after you try your snacks, you go online and rate them. They never send you anything on your ‘hate it’ list and send things on your ‘love it’ list often. Isn’t it cute? Also, this box fits in a mailbox so you’ll never have to worry about picking it up from a post office. I find it funny (and I’m thankful) that graze only lets me pick from the approved sugar count items. They don’t let me cheat and order that dark chocolate smore mix that I clicked on…thanks graze, my weak willpower appreciates it. I’m tempted to sign B up for a regular box so I can try the regular things–OMG cheating. SO BAD.